How can I reuse or recycle egg shells? | How can I recycle this? How can I reuse or recycle egg shells? I was feeling a little poorly the other day so we had the standard unwell tea: chucky eggs and soldiers*. The military men and their ovoid shaped compadres did their work and by the next day, I was up and around again – wondering what to do with the remaining egg shells. I have used broken eggs shells in the garden in the past, to try to deter slugs and snails from my seedlings but I don’t know if it was worth it since the molluscs seemed to get through anyway. So does that actually work? And are there any better uses for them? Reuse: Crush them up and use them to deter slugs and snails from attacking your precious seedlings – they don’t like the rough surface so won’t cross a barrier made from shells. Recycle: A beautiful bit of recycling – bake the shells (to kill any bacteria) then crush them up and add them to chicken food/grit. The chickens reabsorb the calcium and other minerals from the shells and use them to create new eggs! My egg shells just get crushed and thrown in the compost bin. Leave ’em whole and they take a age to breakdown, so crush ’em first. Spreading around plants does deter the slugs a bit, but nothing is truely effective in keeping snails off yer lovely leaves. I have hostas that look like lace curtains..!! Oh, tell me abou t it! I keep trying with different quantities and size of shells fragments but they always seem to get through. I’m starting to think slugs can jump AND fly when there are tasty seedlings to be eaten. Doesn’t salt dry them up or something? Perhaps sprinkling sea salt around your plants will stop the slugs eating them. Using salt to dry up slugs…as in salting the earth? perhaps not the greenest or most viable option. Also…if we care so much about recycling because we don’t want our future generations to drown in our irresponsibly produced waste…are we not being just a tad hypocritical when we kill off animals (such as slugs) who are after all part of the earth and our natural environment in the name of keeping plants alive that are too weak to survive on their own in our part of the planet…part of being and acting green is also accepting the limitations of climate, soil, and natural rainfall in certain parts of the planet. Perhaps if we used plants that naturally live in our area to keep our gardens beautiful these will have their own sets of evolved defenses to address the threat of slugs without us humans having to resort to slug genocide. with snail around hostas. lay down fine copper neating or cover ground with filter aid used in swimming pool filters , Trade name is celite. I haven’t tried this but apparently you can use them to get tea/coffee stains off the inside of thermos flasks. Just crush the (clean) shells up really small, then put them in the flask with some water and shake it up. The grains of shell are abrasive enough to remove the stains but won’t damage the lining – apparently. As regards the hostas. Try this. Mine are now in pots, not in the ground. I have smeared vaseline – or rather, cheap £Shop petroleum jelly – all over the rim of the pot. And the slugs slide off – well some do..!! 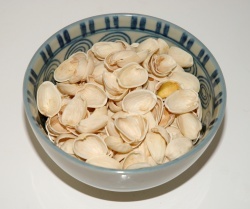 Grind up the shells, add to some vinegar until saturated, boil until reduced by half, and add any sort of alcohol. Use the resulting gel under you chafing dish or in your votive holder instead of buying Sterno. A bit of salt in the vinegar will turn the flame yellow. Wow! I’m trying this for certain! Thank you. Feed them to your dog to make the coat nice and shiny! Crush them up and add them into their food. Since they have been cooked, it is safe for a dog to eat. My dog gets whole eggs whizzed into his food regularly (drop them in the blender with some veg). People used to wash them, dry them slowly in an oven and crush them up into a fine powder to add to foods so that they could up their calcium intake. Useful for the elderly and babes. It is well true! My mum has used it for a year (organic tho) and saw the difference,joints hurt much MUCH less! The same must be for dogs too-good for bones and fur. my mother in law used to put them in a warm oven after baking biscuits and dry them out, and crush them and feed them to the chickens so they would have more calcium. If you don’t bake them first, the chickens will get a taste for the eggs and start eating their eggs, that is what she said. I went to a talk on biodynamics yesterday and he mentioned about using baked egg shell in the compost. I meant to ask why baked? but didn’t get the chance, does anyone know why. is it to make them break down faster? does it make it easier for the calcium to be released into the soil? or is there another reason. I always thought it was to make them less interesting to rats. Baking the eggshell is to get rid of any bacteria (salmonella) still left on the shell also if you are feeding it back to chickens it gets the scent and taste off the eggs so that they don’t get a taste for it and go after the good eggs. Hope that helps. I smash mine into little pieces then mix them with vasaline. I then coat credit card sized bits of cardboard with the mixture and insert the said items into cash machines. It wrecks the machines good and proper! why would you do this????? Hahaha I love it! You got em all bent outta shape!!!! Probably my favorite post! It’s a JOKE guys and dolls, lighten up! save egg shells in a big pot and several months later it would be a nice fertile for plants~! Take a mortar and pestle to them and then sprinkle them in the compost bin. My friend paper-mache’s them into beautiful Christmas ornaments, like really really pretty. How does your friend make this egg mache? This is interesting sounding. They use eggshells a lot in lacquer work in Asia, also could also be used for neat effects when painting. It’d get a lot of texture going with milk paint and hide glue. Or they could be dyed quite easily and sealed with a natural wax or oil for any sort of art project. There’s lots of free & natural dyestuff out in the yard or fields even. Oh, and I almost forgot. I have a tooth-powder with calcium carbonate. I’m sure the baked/ground up eggshells could be used in it’s place for nice clean teeth…and then maybe follow up on the above suggestion and use it as a supplement to. If you feel really ambitious you could just just swallow it after brushing. But, that always seems weird for me, lol. Too many years of regular toothpaste I guess. I can’t believe you people are actually talking about recycling EGG SHELLS!!! Wow. What a waste. How much energy is consumed by baking the egg shells, blending the egg whole to feed to your dog, etc? Recycling largely is counter productive, and is a waste of time. For the dogs, I don’t think you have to bake them… And you can do the grinding manually and mix it into the food yourself. I’ve been searching on the Internet and haven’t really read that the eggshells have to be cooked. What I see is a lot of recommendations of giving it to your canine. Then why are you on this website? Where do you think all of our waste is going to go if at some point we don’t recycle the mass of it? Can we come dump it in your yard? Just pop them in the oven alongside your tea, or the cake your baking. Hey S.C. I think you are going to be late for your corporate meeting at the mega bank or the law firm or something. HURRY UP AND GET MOVING! YOU DON’T HAVE TIME FOR WEBSITES LIKE THIS! i hand my dog the whole egg, he takes it out to the garden and eats it all.. Feed crushed (boiled-egg to avoid cannibalism) shells back to the chucks with oats.. I think oven is to dry them so they crush to a powder rather than a sticky mess..
S.C. has a little bit a point in their rash comment. I wouldn’t bake alone or blend due to the waste of natural resources to do so. But grinding by hand is a nice workout and if you have to bake, consider baking on a separate sheet at the same time something else is being baked. Recycling is only a waste of time if done the wrong way. Make Cascarones! Confetti Eggs. They are great for parties, especially kid parties. We also color them and use them as Easter Eggs. I alternate between the compost heap and my cacti. Crushed eggshells are supposed to be good for cactus. I turn eggshells into tiny planters for spring time (or anytime for that matter) decorations. I like to plant wheat or oat grass in them. You can even draw faces on them and make your own version of chia pets. Here are instructions for making them. after we have used egg shells in my house with just give them back to our chickens to. dandelions in their lawn? D-lions are famous for sucking ALL the nutrients out of the soil; especially minerals. If you grow them in pots, organically, and use LOTS of ground eggshells in the soil you end up with a great healthty vegetable….. Olive oil, sea salt, garlic and voila’! Crush them and spread around plants to drive away snails. I give crushed egg shell to snail! It gives them calcium to make their house robust! btw, I heard that I should delete white membrance of egg before I give it. somebody know the reason? Careful about sprinkling salt in the garden to deter snails. Salt will spoil the soil for your garden plants. i have read some comments about the slugs and snails on the plants and salt does make the slugs dry up and so they don’t have enough water to produce slime to move easier therefore they can’t get to food in time! If you add them to coffee grounds, the coffee will be less acidic. Then off to the compost bin with the whole thing. I leave mine to dry, then periodically blend them down into powder (using a standard blender). By the end of winter, I have a full mason jar of powdered shells. When I set out tomatoes or other calcium-loving plants, I make sure to put a handful of powder in the hole around the roots of the seedling. Helps prevent blossom-end rot in tomatoes, and the extra calcium really seems to make the plants much fuller and stronger. Plants-Put them on your plants. Treat Skin Irritations-Dissolve an eggshell in a small jar of apple cider vinegar (takes about two days) and use the mixture to treat minor skin irritations and itchy skin. Calcium from eggs- You can powder the eggshell by hand as much as you can, then you put it in a coffee grinder so that it may become fine powder and then you can have 1/4th tea spoon a day as it gives 400 mgs of calcium.Oh and don’t forget you need to add some lemon juice to the mixture. Eco-friendly Household Abrasive-Shake crushed eggshells and a little soapy water to scour hard-to-clean items like thermoses and vases. 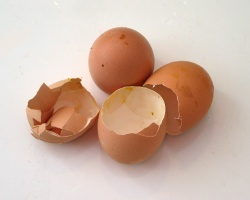 Crushed eggshells can also be used as a nontoxic abrasive on pots and pans. I have been grinding egg shells into a powder and putting on my lawn to eliminate grubs and rabbits for a few years. My lawn looks like cramp. Maybe it’s an invasive weed . Anyways, rather a waste of time. But putting beer in a saucer will attract slugs. It’s sweet and they actually drown. I dump out any beer from bottles or cans in a saucer before recycling them. 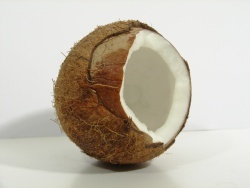 you can use the egg shell as a fertilizer for the plants and egg white can be used as a conditioner. you can see the healthy hair straight after wash. Many bird species are now suffering from calcium deficiency (for several reasons) which makes their eggs & chicks to soft to survive, (leading to depleting bird populations in many geographical areas)! So crushing & spreading your egg shells in your grass/garden (esp around your birdbath) IS DEFINITELY BENEFICIAL… as birds drink & peck away at grasses/seeds/bugs/worms they inadvertently ingest bits of your egg shells as well, which makes their eggs/chicks bones stronger! !